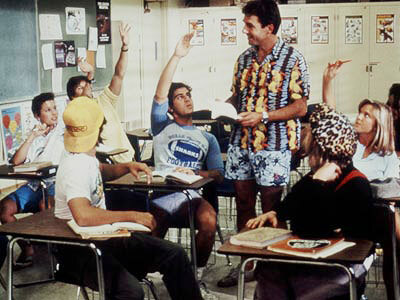 Adam Sandler To Ruin Remake of ‘Summer School’!!! Adam Sandler and his production company ‘Happy Madison’ are coming aboard to produce a remake to the 1987 comedy ‘Summer School’ for Paramount. The original film was directed by Carl Reiner and starred Mark Harmon, Courteny Thorne- Smith, and Kirstie Alley. The original film followed Harmon as a gym teacher who is forced to cancel his big summer plans and teach an english summer school class filled with weirdos. Paramount has been trying to remake this project for the past seven years, but the project has never gotten off the ground. At one point Jordan Kerner (producer on The Smurfs) wanted to get behind a version that had the teacher be much stricter and meaner teacher (contrary to the original’s laid back and fun teacher) who would have problems with one student rather than the whole class. Back a couple of years ago when the project was revived yet again, the studio wanted Star Trek producers Alex Kurtzman and Roberto Orci to tackle the project, but again, nothing happened. Now the studio is hoping that Adam Sandler and his Happy Madison company will bring a much lighter and comedic side to the project. Sandler is not attached to star in the project yet and there are no writers either. But expect all that to change soon. There is a possibility Sandler won’t star but will only produce much like ‘Zookeeper’ or ‘Paul Blart: Mall Cop’. I really don’t have any hope for this movie being good and didn’t we really say all we needed to say with the first ‘Summer School’? This entry was posted on Tuesday, April 3rd, 2012 at 12:00 pm	and is filed under Film, News. You can follow any responses to this entry through the RSS 2.0 feed. You can skip to the end and leave a response. Pinging is currently not allowed. « ‘Game of Thrones’ Season Two Premiere Receives Huge Ratings!! !